Endemic in western Cuba in the province of Pinar del Río and Isla de la Juventud [Isla de Pinos]. The population is relatively small compared to the other varieties but figures of numbers of trees are not available. There are two subpopulations, separated by sea. Forming pure, open, dry fire-climax forest or open woodland with undergrowth of grasses or scattered shrubs on sandy or gravelly, well-drained, acidic soils. Altitudinal range from 1–700m above sea level, with most extensive stands below 40m. The growing is season continuous in a warm tropical climate with long dry spells. Annual precipitation varies mainly with altitude, between ca. 1000–1800mm, with a winter dry season. The timber is used for building purposes. The extent of occurrence falls within the threshold for Vulnerable, but the area of occupancy, calculated on the basis of comprehensive sampling of herbarium collections (26 collections representing 19 localities), works out as 475km² even with a grid width of 5km per dot, which is probably too optimistic. There is no doubt about a continuing decline. This variety therefore meets the criteria for Endangered. 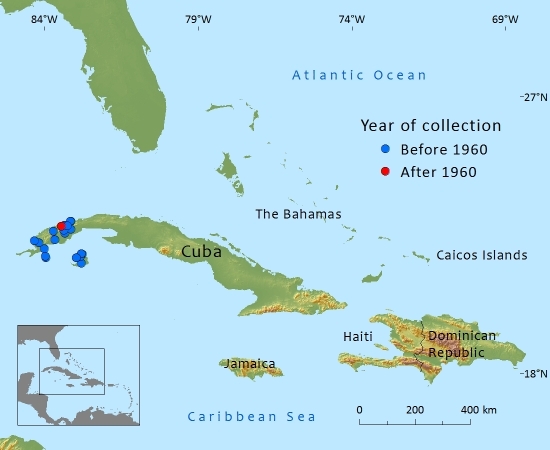 Logging and conversion to pasture have reduced the population in several areas, especially on the mainland of Cuba. This pine is being replaced by Pinus tropicalis due to more frequent fires; the latter species is better adapted to this due to a “grass stage” in the seedling phase. Protection should consist of preserving this species in its habitat, by preventing man-caused fires and reducing the pressure or frequency of logging. Farjon, A. (2013). Pinus caribaea var. caribaea. In: IUCN 2013. IUCN Red List of Threatened Species. Version 2013.1. <www.iucnredlist.org>. Downloaded on 13 July 2013. A.Farjon, 2013. Pinus caribaea var. caribaea, from the website, Threatened Conifers of The World (http://threatenedconifers.rbge.org.uk/taxa/details/841).